Kitty Felde is the host and executive producer of the Book Club for Kids podcast. She’s an award-winning public radio journalist, winning dozens of Golden Mike Awards, AP Awards, an ABA Silver Gavel Awards. She’s reported from Africa, The Netherlands, Canada, Los Angeles, and Washington, DC. Kitty also writes kids books and plays that have been produced around the world. Her play about Quentin Roosevelt is performed every weekend as a tour around the White House. She fell in love with young adult literature when she was still a young adult herself, working at her local public library. 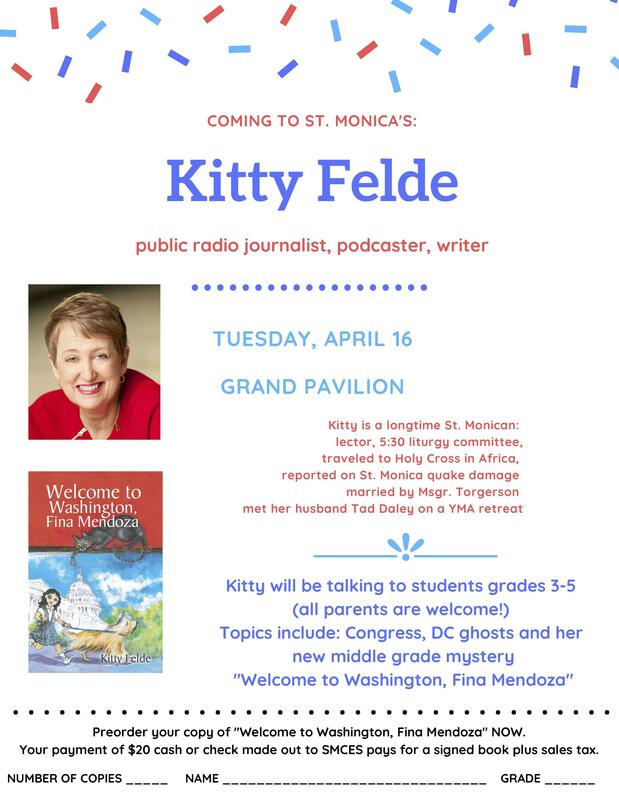 Kitty will be at St. Monica Catholic Community's Grand Pavilion on Tuesday, April 16th. To purchase her most recent book, "Welcome to Washington, Fina Mendoza" download the flyer attached.